As Rep. Raymond Crews, R-Shreveport, approached the podium, Davis firmly shook her head no and repeatedly told him, “Do not do this.” Several members came rushing over to support her, and Crews backed off, prompting applause from other legislators. 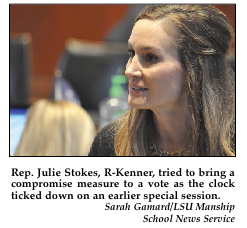 That dramatic moment reminded nearly everyone in the chamber of how another Republican had rushed to the microphone to stop Rep. Julie Stokes, R-Kenner, from calling for a compromise vote earlier this month. Stokes lost then, while Davis’ bill passed Friday, breaking a logjam and setting the state on a path to great financial stability. But the risks that both took in seeking a compromise on such a high-stakes issue also show how women are beginning to have a larger influence in a male-dominated Legislature that has not always been so hospitable to them. “So much of what we saw this year was political gamesmanship, and most women are not that interested in that,” Stokes said in an interview Saturday. “We just want to solve problems and get our state on the right track.” “I do think it flows naturally for women to not want to see the division,” she added. “There is a desire to bring people together.” That seems to be the case, she said, even though some of the most liberal and most conservative House members are women who believe deeply in their issues. But when it comes to pushing for consensus, she said, “it makes sense that a woman would actually step up and fill that role.” That role was especially crucial in the House, where Republican leaders have been at loggerheads with Gov. John Bel Edwards since he took office in early 2016. Davis and Stokes stood out in this year’s sessions, but other women also played important roles even though only about 15 percent of state legislators are women. Sharon Hewitt, R-Slidell, helped lead a push to free up millions of dollars from dedicated funds to make it easier to move money around the state budget, and Rep. Katrina Jackson, D-Monroe, sponsored a bill that raised $34 million in revenue. Rep. Barbara Carpenter, D-Baton Rouge, got a bill passed to require state agencies to develop sexual harassment policies and train employees on them. Sen. Karen Carter Peterson, D-New Orleans, delivered a tongue-lashing after an earlier special session fell apart, calling on the representative, Alan Seabaugh, a Republican from Shreveport, who blocked Stokes’ bid for a compromise, to apologize to residents of the state. Louisiana ranked lowest in the nation in 2015 in the percentage of female legislators, according to The Institute of Women’s Policy Research, a group based in Washington D.C. The study found that between 2005 and 2014, Louisiana saw the largest decline of female representation in the country. Since then, the state has rebounded a bit and now ranks 45th in the percentage of female state legislators. “It has been a good ol’ boy system for so long,” said Rep. Pat Smith, D-Baton Rouge. “Women for a long time have felt that they do not have what it takes to take on the challenges of the Legislature.” Rep. C. Denise Marcelle, D-Baton Rouge, said that when she ran for the city council in 2008, other women also were in the race. “I kept hearing the phrase: ‘We don’t need all of those women in leadership,’” she said. “We need males in leadership.’” When Davis ran for the House in 2015, Jerry Arbour, a former East Baton Rouge Parish School Board member, told her that “a woman’s place is in the kitchen.” He later claimed it was a joke. Instead of ignoring the comment, Davis integrated it in her campaign. She sent out mailers to her district with the comment written alongside her accomplishments, including her role as former deputy commissioner of insurance. The flyer also included a cake recipe and a photo of a woman wearing an apron. “For the record, I’m pretty good in the kitchen, too,” Davis wrote. Davis won a runoff against Republican Ryan Heck with 55 percent of the vote. Over the years, female legislators have had to endure remarks they considered demeaning. In 2016, Rep. Kenny Havard, R-St. Francisville, made national headlines by proposing an amendment requiring female strippers to weigh less than 161 pounds. The underlying bill would have blocked women under the age of 21 from becoming strippers, and after women on the floor expressed outrage at his amendment, Havard said it was a joke to poke fun at government overreach. When asked about that again Thursday, Havard said he still did not think he should apologize for them.